In 2015 the Kookaburra Midnight hockey stick is perfect for any reasonable standard hockey player looking to review a stick that will help with dribbling and reverse side passes. Available at a ridiculous price you can buy a really good hockey stick here for way under £100. Let’s start the review looking at the dribbling prowess of the Kookaburra Midnight. Kookaburra have had a feature available for many years called the Kookaburra Skill Zone. This feature is a subtle indent in the face of the hockey stick’s head designed to slightly cup the ball. With the Skillzone included, the Kookaburra Midnight really helps players to control the ball in fast dribbling, particularly when switching from side to side with the ball and when dribbling on the reverse side. 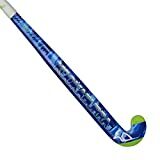 My friend is left handed and predominately tries to play with the stick turned, she swears by the Kookaburra Skillzone. While on the reverse side another couple of features of the Kookaburra Midnight we are going to review are designed to help, this time to help hitting the ball. Performing solid reverse side hits requires you as the player to strike the ball with the edge of the stick, the reverse edge, assisting with this action the Kookaburra Midnight has a great feature called “Precision Edge”. Founded dotted around the Kookaburra range and specifically for this review found on the Kookaburra Midnight, the precision edge means the impact zone on the reverse edge is flatter, giving a wider surface area to connect with and making hits more accurate. This reverse edge is then reinforced too, with a higher concentration of material to increase the power of these shots. Whether you are already good at hitting on the reverse side and want to increase the power or you are looking to improve this area of your game on the field, the Kookaburra Midnight’s features will help. Another way to improve your reverse hitting, is to increase the speed at which you swing the hockey stick at the ball. While the Precision Edge and reinforcement improve the result of the hit, being available in Super Light, the weight of the Kookaburra Midnight will help you swing the stick quicker. Not just about the reverse side, the Kookaburra Midnight is also good in other areas. There is a good balance of carbon fibre and fibreglass, in fact an exact 50% carbon to 50% fibre glass split which makes for a good soft feel, especially when receiving the ball. You will loose some of the stiffness and power that comes from higher carbon content but still have enough to play with. Another feature I love from Kookaburra is the SFR or Soft Feel Resin, in the head of some of their sticks. This is designed to cushion impact on the head by the ball to help you bring the ball under control quicker. Last but not least we will quickly review the shaft bow. The Kookaburra Midnight hockey stick has a long, smooth but noticeable bow starting high in the shaft by comparison to other shapes available. It’s almost the maximum curve allowed but because of where it reaches its apex at 380mm up from the head it doesn’t feel particularly bent. Because of the position of the bow it won’t suit you if you are looking to improve your areal skills, little lifts over sticks when dribbling or big overhead passes won’t be helped by this stick. Overall the Kookaburra Midnight will make a great hockey stick for any player preferring to use the reverse side of the stick for both dribbling and hitting passes or shots. In my opinion it would really suit a left back who can play though the field by dribbling out of defence.